Hey, ‘Mr Jingles’ here, an 8-9 year old male Bull Mastiff Cross. I am a little larger than a mouse but just as gentle in nature. A true friend who loves a cuddle and will try to squeeze next to you on the sofa. I’m sure you’ve been eating too many mince pies! I love to travel so let’s go sight-seeing together and enjoy my retirement. Sadly I am not a water baby and don’t have sea legs so we would have to stay on land. As I am slowly maturing I enjoy light exercise and short potters to keep these old bones moving. Step overs are a marvelous way to stretch the legs and shake those cobwebs away. Now I do like a good Scooby snack but sadly I am quite selfish and will not share and please don’t take me to the Vet unless it is necessary as I really don’t feel at ease there. 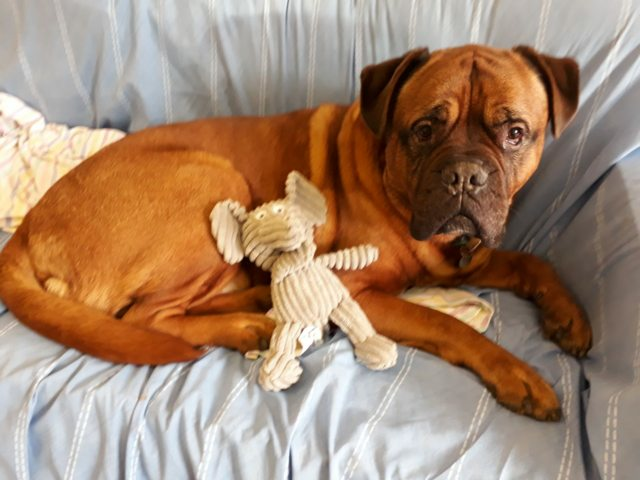 It is in my nature to protect and be a loyal companion so I’m seeking an experienced Bull Mastiff household with older teenage children and no other animals. I can be a bit of a bull dozer in the garden so ensure everywhere is secure! He is neutered, vaccinated and microchipped.